Don't ruin the holidays by preparing a dried out turkey! 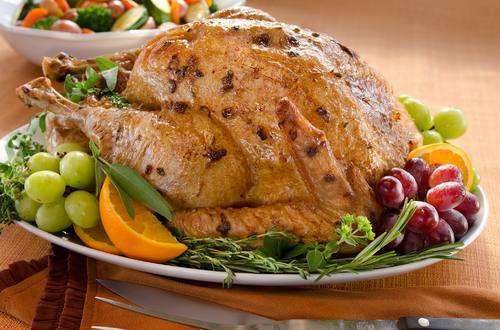 Using mayonnaise in the preparation of your turkey helps to keep it moist and delicious! Your whole family is sure to love it! 1 Preheat oven to 425°. Remove giblets from turkey cavities and rinse turkey inside and out; pat dry with paper towels; set aside. 2 Combine Hellmann's® or Best Foods® Real Mayonnaise, Knorr® Chicken flavor Bouillon, shallot and herbs in medium bowl; set aside. Starting at neck opening, gently loosen skin on turkey and evenly spread 1/2 of the mayonnaise mixture under skin. Tie legs together with kitchen string. 3 Arrange turkey, breast side up, in large shallow roasting pan with rack; rub remaining mayonnaise mixture over outside of turkey. Tent with heavy-duty aluminum foil and roast for 1 hour. Decrease oven to 350° and roast turkey 1-1/2 hours. Remove foil and continue roasting, about 30 minutes, basting occasionally with pan juices, until thermometer inserted in thickest part of the thigh reaches 165°and skin is browned and crispy. Let stand covered loosely with foil 20 minutes before carving. Serve with hot, prepared Knorr® Roasted Turkey gravy mix . *SUBSTITUTION:  Use 1 tsp. dried rosemary, sage and/or thyme, crushed.